Years have a funny way of creeping up on us, don’t they? We think we know exactly where they are then some time around August they hide behind our backs, jump out and whack us in the face with a fist full of December. BAM! The year’s out. Done and dusted. And all those ambitions will have to wait until next year. So I’m ending 2014 with a few intentions left hanging, the biggy being the completion of my third book. I haven’t finished it, but I’m really, really close. With a belly full of chocolate and a head full of good intentions I set out to dominate the literary landscape. My first plan, to elaborately murder all other children’s writers is soon dismissed as I’m not big on driving, and they live all over the country! I fall back on plan B: write stuff. Sorrowline is on the longlist for the prestigious Brandford Boase Award. Even though it didn’t make the cut for the shortlist I’m still thrilled. But it’s not the only awards news: Sorrowline is also short-listed for the Spellbinding 2014 award. And Read Regional kicks off! 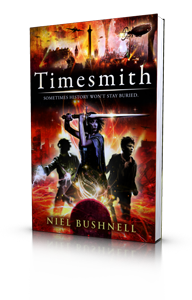 To coincide with World Book Day Timesmith is published in the UK! I do a launch event in my local Waterstones and I feel like a proper author! I’m temporarily teleported to an alternative dimension where I’m the only author. I’m hailed as a gold-like hero and am promoted to the board of Waterstones AND Amazon. For a few short weeks books outsell nappies, chocolate and shampoo. But the stress of writing ALL books is just too much and my pen runs out of ink. I return home in shame after the great Waterstones/Amazon War wipes out the entire population of East Grinstead. Spring spings and I boing all over the place! I make a return trip to Sweden at the invitation of The English Bookshop and meet lots of very friendly readers. Sorrowline is published in Brazil! This is the third foreign language edition of my first book after Germany and Thailand. I also do quite a few events including one for the National Literary Trust at St James’ Park in Newcastle. But it’s not the only unusual event: I talk at the launch of the Cultural Ambassadors scheme in my home town and take part in a live chat show in a comedy club in Newcastle! Normal service resumes next month. I have a blast working with the super talented Mark Jobe helping the pupils of Macmillan Academy in Middlesbrough to write, develop and animate their own film about climate change. The project even won a few awards and was screened at a festival in Hollywood! Time for a break! I have a family holiday in Spain and, while on a day trip to the beautiful city of Barcelona, I have a strange literary encounter. 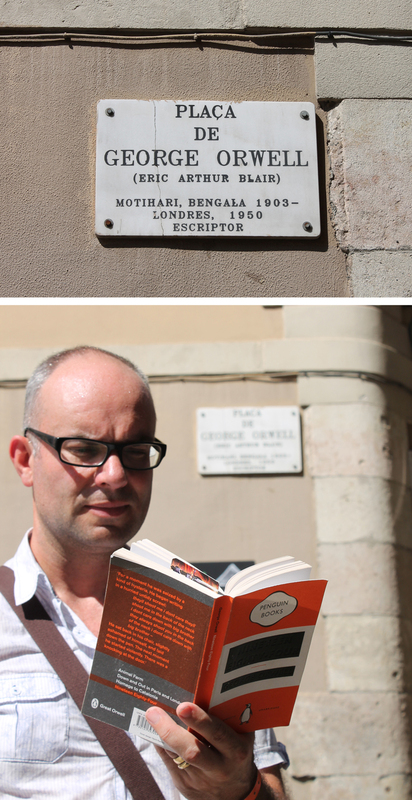 I’m reading George Orwell’s 1984 when I stumble into square named after the great man! I had no idea he had such a big connection to the city until that moment. I’ve now read more about his life and have realised what a fascinating figure he was. I attend FantasyCon in York. It’s my first fantasy convention and I have a great time meeting up with lots of other Team Mushens authors. It’s also my first visit to The District CE Primary in Newton-le-Willows where I’m Patron of Reading. 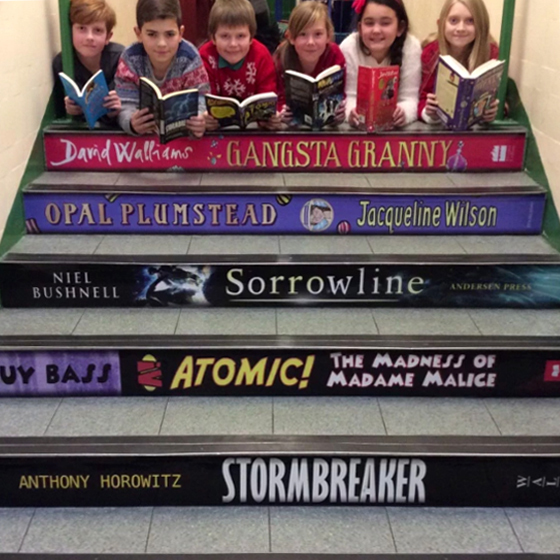 The staff and pupils have such enthusiasm for books! 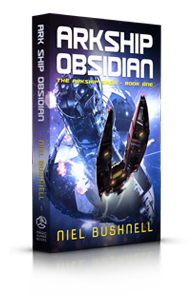 I’m deep into writing my next book, a dystopian sci-fi adventure about two siblings facing the end of the world! I’m hoping to finish by Christmas, but it might take a bit longer than that. It’s good to be writing something new again. I’m involved with a writing workshop for the pupils of The Avenue Primary School in Middlesbrough, helping them create their own story for a play about electricity consumption. Over a series of workshops they brainstorm ideas, develop characters and story then rehearse and perform the play. The brilliant staff at the District CE reveal their Story Steps, and I’m thrilled to be one of the steps! I can’t wait to visit them again in the New Year and see it for myself. It’s the end of the year already! It’s been a bit of a blur, hasn’t it? As Christmas fades away I’m still working on the new project. There’s a lot of story to tell so I’m not worried that it’s taken me longer than I’d hoped. Roll on 2015 and a fresh year to squander! I hope the New Year is good to you, thanks for your support during 2014. As the year draws to a close I’m about to complete my last school event of 2014. I’ve done lots of talks, workshops and signings this year so I thought I’d share some highlights with you. MacMillan Academy, Middlesbrough. I spent a week at the MacMillan Academy helping the pupils develop and write a script for an animated film about climate change. Under the guidance of animator Mark Jobe the pupils designed and animated their script. The completed film has gone on to be short-listed for awards and screened at the Berwick Film & Media Arts Festival, Kids for Kids UK at the BFI Southbank and will be screened at Hollywood Shorts in Los Angeles this November. The District CE Primary, Newton-le-Willows. I was thrilled to be asked to be Patron of Reading by the staff at the District CE Primary school. I enjoyed visiting their pupils in September where I was spoilt with cakes in the staff room and a 3D cut-out display of my books in reception! Read Regional 2014. Read Regional is a promotional campaign that connects writers living in the North East and Yorkshire with their local readers. Organised through New Writing North the campaign partners with library authorities throughout the region to hold author events and to ensure brilliant books by northern authors are stocked in libraries. I was very pleased to be included in the 2014 campaign, I visited libraries all over the north of England and met hundreds of enthusiastic readers. The Avenue Primary School, Middlesbrough.This Tees Valley Arts funded project helped the pupils to create their own story for a play about electricity consumption. Over a series of workshops they brainstormed ideas, developed characters and the story then rehearsed and performed the play. The Uppsala International Authors Stage, Uppsala City Library, Sweden. 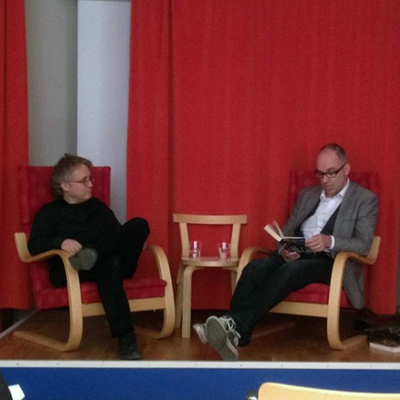 This was my second trip to Sweden as an author, having been to the Gothenburg Book Fair in 2013. This time I went to Uppsala at the invitation of Jan from The English Bookshop. He organised three events including a talk and signing at the city library and his bookshop. And there were so many more I could mention! I did a day of back-to-back talks at St James’ Park football ground in Newcastle for the National Literacy Trust Premier League Reading Stars initiative (and I reversed my car into a bollard outside the stadium!) and a book signing in Waterstones for the launch of Timesmith. But every event has memorable moments, little gems that linger in the mind. Sometimes it’s the amazing unexpected ideas that a pupil will come up with, sometimes it’s the moments of comedy that I shouldn’t be laughing at – a carpet fart by a very young pupil springs to mind, but most of all it’s the genuine excitement and enthusiasm I see for reading when a school brings an author in to visit. 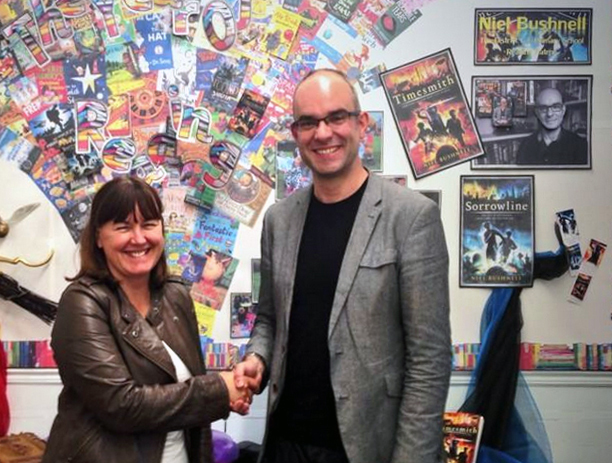 Of course I’m bound to tell you how important author visits can be for pupils! But don’t take my word for it. There’s been lots of research done that shows the great benefits of getting authors into schools. You can find some of it here. Janet Dowey, Learning Resource Centre Manager, Unity City Academy, Middlesbrough. Miss Clark (AST in Literacy), Manor College of Technology, Hartlepool. 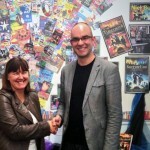 If your school, library, bookshop or festival is looking for a children’s author then please do get in touch. I’m booking up now for 2015 and keen to meet new readers. For event inquiries please email .